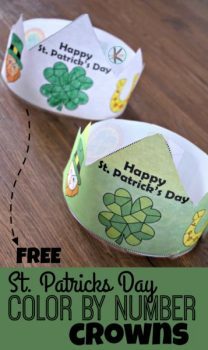 Combine two activities in one with these St. Patrick’s Day Color by Number Crowns from Kindergarten Worksheets and Games! It’s a good activity for your child to practice number recognition for numbers 1-10, and there are 6 pictures on each crown to color. Once they color, your child can cut out the crown pieces and put them together and adjust for size! Get the St. Patrick’s Day Color by Number Crowns here!